"Last year, a prominent Chinese economist declared that his country had shed its status as a mere emerging superpower and ascended to a position of unchallenged supremacy. China, Tsinghua University’s Hu Angang said, eclipsed U.S. economic power in 2013 and surpassed American technological might in 2015." ….blimey, when did that happen? Fake news - Chinese edition? "The architect of at least some of the upheaval appears to be Mr. Trump, whose unyielding pursuit of tariffs has raised worries that China is being driven into a trade war it cannot win – and that part of the blame lies with Beijing for adopting a domineering posture that is now provoking global reprisal." The President says trade wars are easy to win. "Even the financial markets offered a symbolic portent on Friday of Beijing’s changing circumstances, after Japan’s stock-market value overtook that of China for the first time since 2014." Does that mean Japan is coming back as the #2 economy? "In Pakistan, meanwhile, China has been accused of 'reckless lending.' Myanmar is moving to vastly diminish the size of a port project backed by Chinese money over debt concerns, Reuters reported this week." ….what? Muslims and military dictators aren't bending over for money? ...from some Chinese bloke in California. "Mr. Xi 'retains power as the No. 1, but his authority has been severely dented,' Mr. Lam said. 'That means the degree to which people respect him as a worthy leader of China.'" ...from some Chinese bloke in Hong Kong. If Xi is not careful, his faction could lose control. I foresee another political purge in the near future in the name of anti-corruption campaign. China, along with a few Eastern Hemisphere nations, may well be set to claim the Kingdom, the goose that laid the golden egg i.e. Western civilization. Our Chinese entity brought to the market in a very short time frame a solution that our UK chums were still figuring out ridiculous toll gates after 5 years of tossing it off. They also get that the let-in-the-barbarians-at-the-gate-so-we-can-virtue-signal is a massive opportunity for them to leap-frog ahead of Europe. The inner circle that just made him dictator for life? Our Chinese entity brought to the market in a very short time frame a solution that our UK chums were still figuring out ridiculous toll gates after 5 years of tossing it off. Is that because they work harder or they cross all ethical lines to get results? My understanding is that the inner circle is still intact, but the support for that circle is losing a grip. Xi "ran" on the sense on nationalism, which has succeed thus far; however national pride can only do so much to put food on the table, and this is hurting him right now. Also I believe China thought the rest of the world is going to play hardball against the US, but that strategy did not play out too well. At this stage, they have more of an entrepreneurial spirit than my fellow compatriots. Number of reasons, some cultural both in the organisation, but also in the national psyche. Chinese hegemony is inevitable. It is just a matter of time. A black guy I worked with was of the opinion that where Chinese and Indians coexisted - parts of Asia and the Carribean, for example - the Chinese were always the top dog. I subsequently read the Victorian Galton’s ‘Africa for the Chinese’ article in The Times. He believed Chinese were a better choice than what he called ’Hindoos’ and that Africa had an unsuitable climate for a white man. Afrikaaners would disagree with the last point. Certainly Chinese are unencumbered by colonial guilt and able to extract the mineral wealth of the continent with appropriate investments and working with the countries’ rulers. People are starving in China? How's that possible in the world of communism? From what I read, it's not that easy. The entire financial system is set up to work in favour of the US $. This decision was made in 1948 (I believe) by the US and Great Britain, or more precisely by the rulers of the global financial system. For the other nations involved it was more of an FYI. Let's not forget the stranglehold of the IMF and the FED and it's counterparts in other countries (most of the Western so called "National Banks" are lead by Goldmann-Sachs people and they won't act against the mother corporation). However, Russia and China allow other nations to pay for goods in their respective national currency or, even better, with Gold. From what I've been told by my boss, who travels frequently to China now, there is a huge discrepancy between the prosperous coastal regions and the inner ones when it comes to wealth. This has always been the case, particularly between the ethic Chinese and Han Chinese, thus the longed governmental emphasis on social harmony. There is quite bit of dissatisfaction among the common Chinese population that some have discussed of bringing Maoism back to Central level of governance. The economic boom did not benefit poor as much as the government has portrayed. Sure the "Xiao kang" dream has been achieved by the masses, but the level of living gap is huge. "In 1998, he had written that he 'strongly supported free trade.' But after China joined the World Trade Organization (WTO) in 2001, he started to notice that his MBA students were losing their jobs despite their sterling qualifications. He concluded that China’s trade practices–including export and production subsidies, currency manipulation and theft of intellectual property–were putting Americans at an unfair disadvantage. In other words, Navarro seemed to see in China a scapegoat for people like himself: well-credentialed Americans denied access to the success they felt they’d earned. He wrote his first book on the phenomenon, The Coming China Wars, in 2006, followed by 2011’s Death by China and 2015’s Crouching Tiger. Death by China was made into a documentary narrated by Martin Sheen. And it attracted the attention of then businessman Trump. 'I urge you to see it,' he wrote in a promotional blurb. When Trump ran for President, Navarro heard a politician willing to take on the evils of globalism, foreign influence and China–someone who, like Navarro, was convinced America was getting screwed." 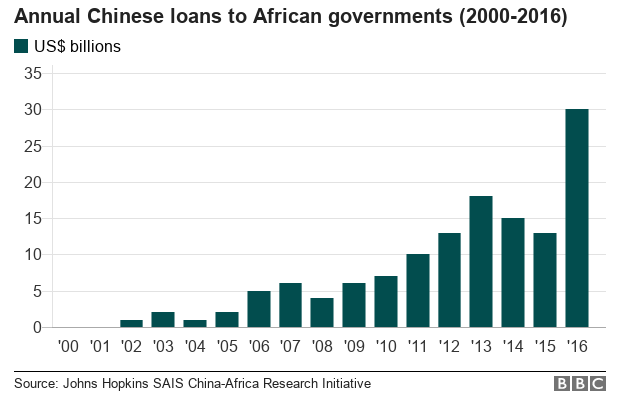 "China is now the single largest bilateral financier of infrastructure in Africa, surpassing the ADB, the European Commission, the European Investment Bank, the International Finance Corporation, the World Bank and the Group of eight (G8) countries combined."